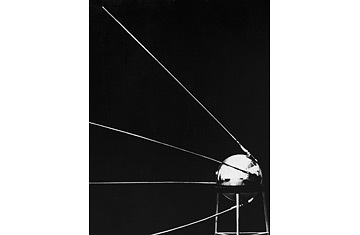 Oct. 4, 1957  The Soviet Union launched Sputnik, the world's first satellite, and the U.S. reacted the way any mature, technologically savvy nation would  which is to say by losing its marbles. The Soviets had seized the high ground of space and would soon be gliding over North America lobbing bombs on the U.S. as easily as if they were dropping overripe fruit from a highway overpass. No one had quite worked through how a 183-lb. aluminum ball that did little more than beep was going to accomplish all that, but no matter, the danger seemed real. The good news: the space race was on.